Shop online for 17 cottage plastic models at discounts up to 20%. 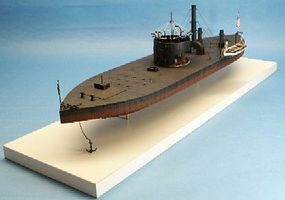 Ships is the most popular of the 3 cottage plastic models categories, then Resin, and Parts/Acc.. This is the 1/72 Scale H.L. 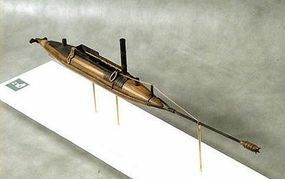 Hunley Confederate Submarine (11-1/2''L) Resin Model Kit from Cottage Industry Models. 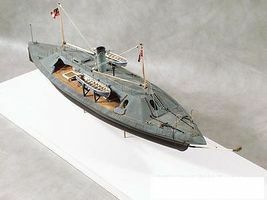 This is the 1/96 Scale Lt. William Cushing's US Steam Picket Boat (4''L) Plastic Model Kit from Cottage Industry Models. 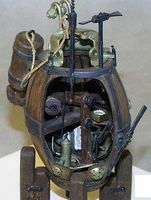 This is the 1/32 Scale David Bushnells Turtle Submarine American Revolutionary War Resin Model Kit from Cottage Industry Models. This is the 1/72 Scale CSS David Confederate Torpedo Boat Civil War Plastic Model Kit from Cottage Industry Models. 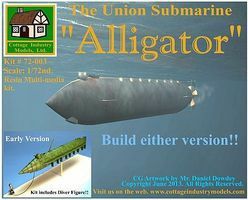 This is the 1/72 Scale Alligator The Union Submarine Plastic Model Kit from Cottage Industry Models. This is the 1/96 Scale USS Monitor John Ericssion's Cheesebox on a Raft Union Ironclad Warship (22''L) Plastic Model Kit from Cottage Industry Models. This is the 1/96 Scale CSS Albemarle Confederate Ironclad Warship (19-1/2''L) Plastic Model Kit from Cottage Industry Models. This is the 1/96 Scale CSS Palmetto State Confederate Ironclad Warship (27''L) Plastic Model Kit from Cottage Industry Models. This is the 1/96 Scale USS Keokuk Union Ironclad Warship (19-1/2''L) Plastic Model Kit from Cottage Industry Models. This is the 1/96 Scale CSS Arkansas Ironclad Warship (23''L) Model Kit from Cottage Industry Models. This is the 1/96 Scale CSS Tennessee Ironclad Warship (26''L) Plastic Model Kit from Cottage Industry Models. This is the 1/32 Scale Robert Fulton's Nautilus Submarine Plastic Model Kit from Cottage Industry Models. 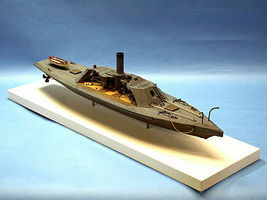 This is the 1/32 Scale David Confederate Torpedo Boat Civil War Plastic Model Kit from Cottage Industry Models. 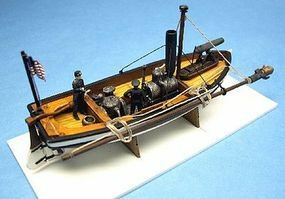 This is the 1/96 Scale Naval Artillery Upgrade Set for American Civil War Steamships Plastic Model Kit from Cottage Industry Models. This is the 1/24 Scale H.L. Hunley Confederate Submarine (33''L) Plastic Model Kit from Cottage Industry Models. This is the 1/96 Scale Naval Artillery Upgrade Set for Confederate Ironclad Warships Plastic Model Kit from Cottage Industry Models.